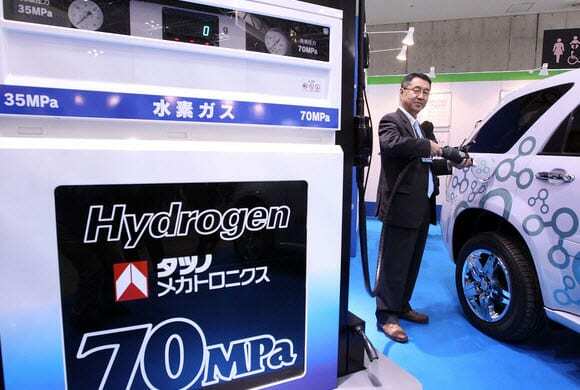 This last Thursday, marked the official opening of the International Hydrogen and Fuel Cell Expo held in Tokyo, Japan. A multitude of companies have gathered to showcase their developments and research in the field of hydrogen energy. In the past, hybrid fuel cells were all the buzz, but hydrogen has taken the spotlight this year. In attendance are the typical crowd of enthusiasts and those whose interest in alternative fuels have been provoked over the years. Among them are government officials who are looking for the next breakthrough in alternative energies. This year, they may find what they are looking for. Hydrogen fuel cells have faced many challenges over the years. The fuel cells themselves are costly to produce, requiring no small amount of platinum and titanium as well as other expensive materials. Along with issues of efficient storage, one of the primary concerns is the generation hydrogen. While the process is relatively simple, most fuel cells of the past have used electricity to produce hydrogen. The majority of electricity is still generated by burning fossil-fuels, thus creating pollution and negating what benefits hydrogen has to offer. primary power source, but make use of electricity generated by solar energy to power hydrogen conversions. This makes a completely self-sustaining system that has absolutely no negative effects on the environment. This year’s expo is expected to be an eye-opener for many that hydrogen fuel is not just a novelty technology, but a fully viable and efficient power source for the future.